Bridal trends tend to be less variant than other fashion trends, as more often than not, brides want a dress that's timeless and classic. It's not often that you go to a wedding and the bride is wearing a black frothy dress or a jewel-encrusted jumpsuit, right? That being said, there are some key trends even the most classic of brides might be tempted by this season. We turned to Caroline Burstein, founder of Browns Bride, to discover the wedding dress trends she's most excited about right now and that she believes will have the biggest impact over the next 12 months. Keep scrolling to see—and shop—the five biggest wedding dress trends for 2018. 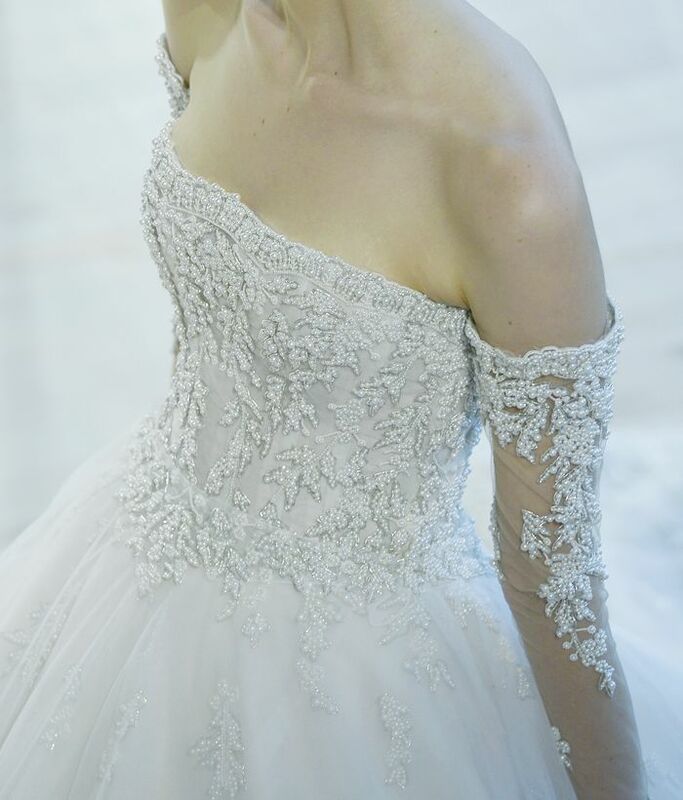 Pictured: an Ines Di Santo off-the-shoulder gown. The off-the-shoulder trend has been a huge commercial success over the past few seasons, and it has now made its way into bridalwear too, as seen at Ines Di Santo. Pictured: a jumpsuit at Gemy Maalouf. Next up on Burstein's list of key bridal trends, we have a jumpsuit, and she notes that Peter Langner is one of the key designers leading this. Pictured: a short Naeem Khan wedding dress. Another trend that Burnstein predicts will be key in 2018 is short dresses—this is for brides looking to break conventions and opt for something a little different. Pictured: a Sachin & Babi wedding dress. Burstein says that when it comes to colour, nudes and blush pinks will have the biggest impact in 2018, as seen at Monique Lhuillier and Sachin & Babi. As for details, bows were everywhere during 2018 Bridal Fashion Week, as the likes of Marchesa and Oscar de la Renta adorned their gowns with dramatic bows, ties and sashes. Next up, see our edit of the best high-street wedding dresses.